These Strawberry Crepes are SO good! 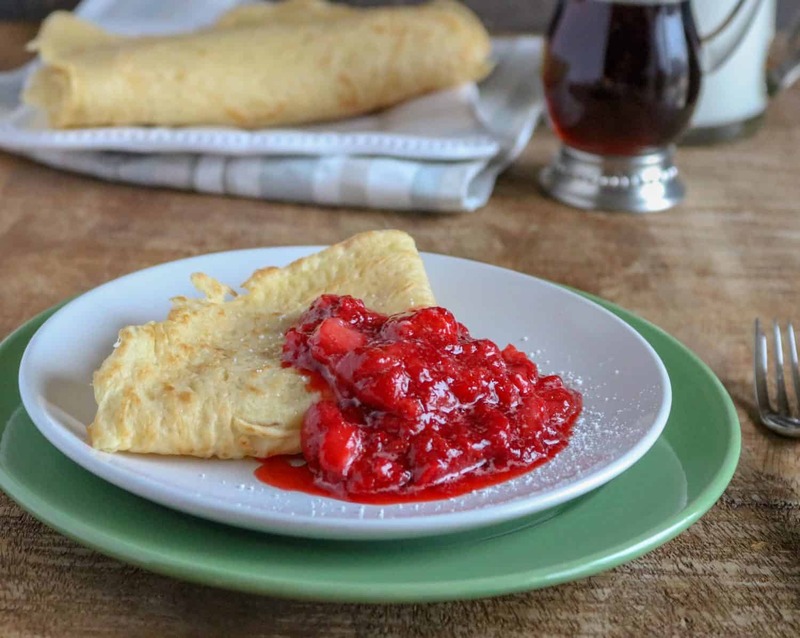 You’ll use a basic crepe recipe and serve them with a simple yet incredibly flavorful strawberry sauce. 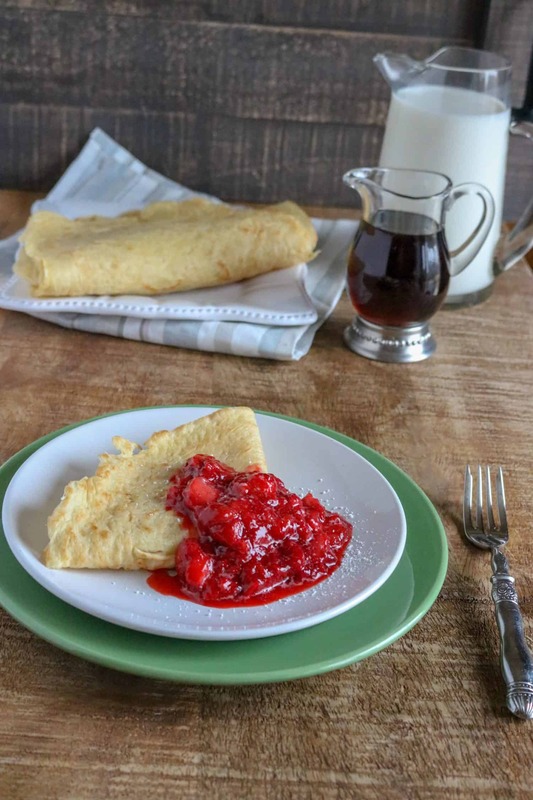 These Strawberry Crepes for make a light and refreshing breakfast or dessert! I love crepes. Especially crepes with berries. Like Cherry Crepes. Strawberry Crepes, however, deserve a throne. They are just that good. There is something about a fresh berry that tastes so good and so sweet. Still waiting for some fresh berries. Believe me, I cannot wait for strawberry picking season. I LOVE to pick fresh strawberries. Now… I know you’re here for the Strawberry Crepes, and I can’t say I blame you. These crepes won’t disappoint. Start with the Basic Crepe recipe, and while you’re cooking those, have the strawberries cooking in a saucepan. It’s a simple strawberry sauce… much like a jam. 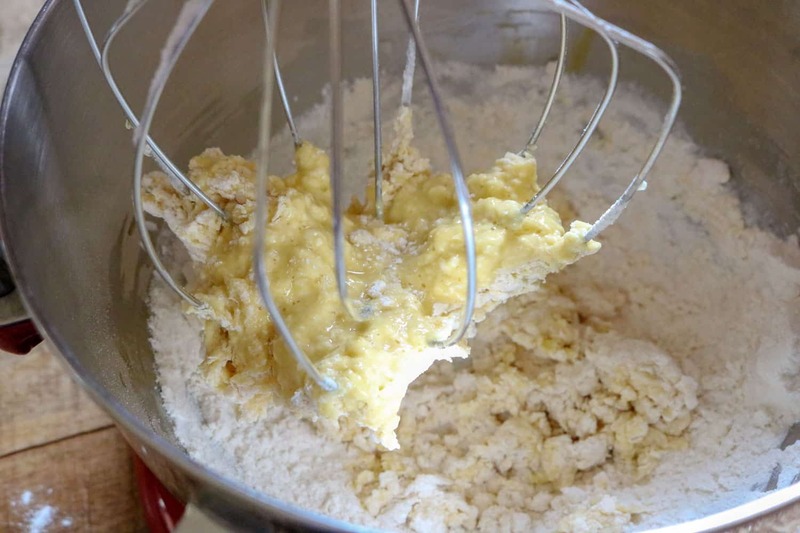 Step #1: Add ingredients in the order listed, beating together eggs and flour with a whisk or in a mixer. Step #2: Slowly add water until the mixture is smooth. Add in sugar and salt and then mix in the melted butter, ensuring that batter is as smooth as possible. Step #3: Heat skillet over medium low heat and spray lightly with cooking spray. Pour out a small amount of batter and spread it around with a wooden spoon or spatula. You want the crepes to be thin! Step #4: Lightly cook on each side. The crepe is ready to flip when the top starts to cook (similar to a pancake), and a spatula can slide under the crepe easily. 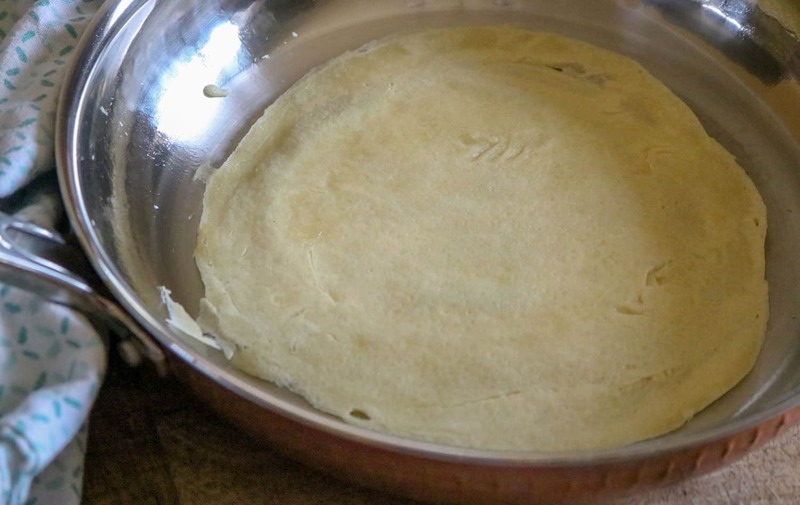 This recipe will make between 6-10 crepes depending on the crepe size. Step #1: Combine all ingredients in a saucepan. Cooking time will vary depending on type of strawberries used (fresh or frozen). Note: I’m sure orange juice (instead of water) would work beautifully as well. 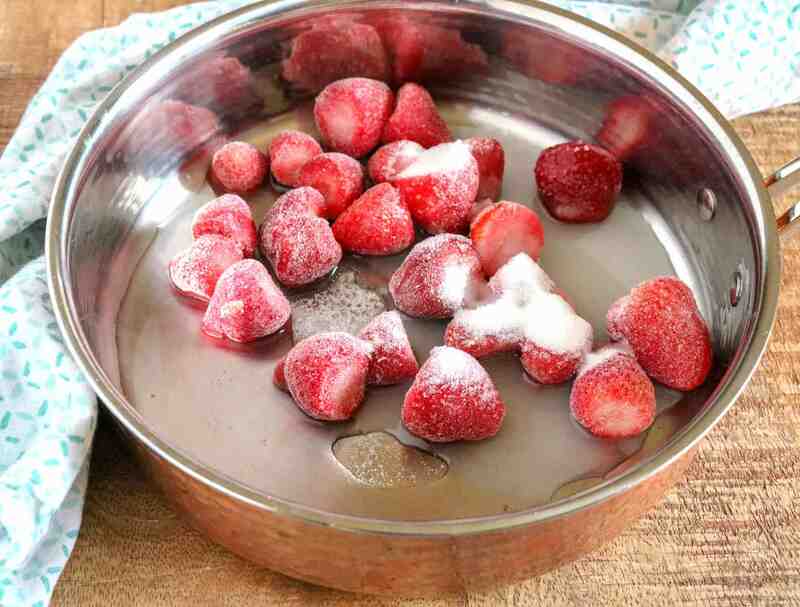 If you don’t have fresh strawberries, frozen will work just as well. I used some frozen strawberries that I had on hand because I wanted to use the fresh strawberries for something else. Cook the sauce up on medium heat, and crush the strawberries as they begin to soften, breaking them up into smaller pieces. You could also chop the strawberries beforehand, but I prefer the crushed strawberries because it gets the juices incorporated with the sugar and water for that delicious jammy effect. Step #2: As the strawberry sauce starts to thicken, you’ll want to turn it down to low and continue to stir on and off while you are making all your crepes. Prepare crepes by folding them as shown in the photo and serve with strawberry sauce. 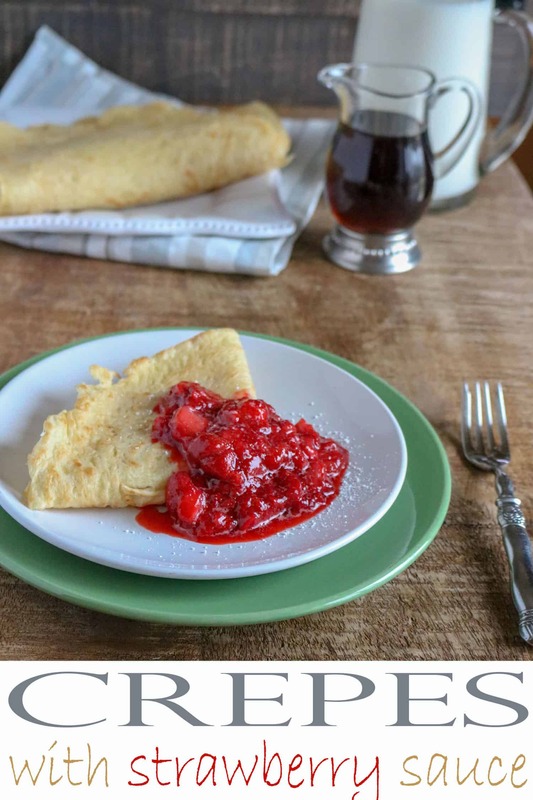 (Or you could put the strawberry sauce in the Strawberry Crepes before folding.) If desired, sprinkle with some powdered sugar. Enjoy your amazing Strawberry Crepes! These Strawberry Crepes are SO good! Give them a try. Add ingredients in the order listed, beating together eggs and flour with a whisk or in mixer. Slowly add in water so mixture is smooth. 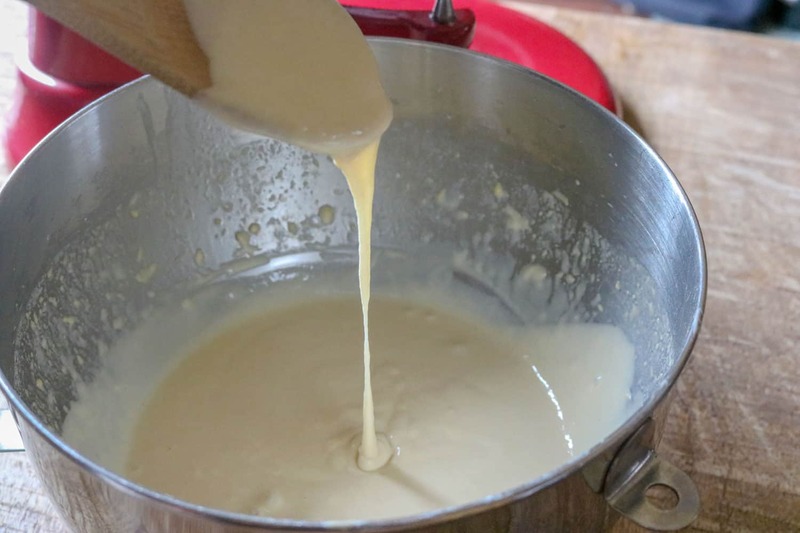 Add in sugar and salt and then mix in the melted butter, ensuring that batter is as smooth as possible. Heat skillet over medium low heat and spray lightly with cooking spray. Pour out a small amount of batter and spread it around with a wooden spoon or spatula. You want the crepes to be thin. Lightly cook on each side. The crepe is ready to flip when the top starts to cook (similar to a pancake), and a spatula can slide under the crepe easily. Combine all ingredients in a saucepan and cook over medium until strawberries have softened. Cooking time will vary depending on type of strawberries used (fresh or frozen). When strawberries have softened, crush them and stir to combine with sugar water. As the sauce thickens, continue stirring now and then. Turn to low and stir on and off as you prepare the crepes. sounds good! it is almost time to start planting here, last frost is usually around the 20th of April but this year being so crazy who can tell. We had below freezing temps about 2 weeks ago and then it was still in the mid-30’s at night several times last week – hopefully that is past us now. I no longer have strawberry plants they all died off a couple years ago. I love strawberries! I make a bunch of homemade jam during the summer, my kids love it 🙂 This recipe looks delicious! Thanks! I need to try making jam sometime. These look and sounds fantastic! Your crepes look and sound totally gorgeous! Awe! Thanks Rosie. I hope you have time to make them and can enjoy them yourself. Thank you. I love recipes I can print off and take to kitchen (messy cook). Looks so good and just yesterday got cherries I need to do something with, great timing. This is the first time making one of your recipes, and it was a simple, 15-minute breakfast dish. Although I spent 2 hours making it because of technical difficulties thanks for your nice guidance. Crepes can be difficult the first time. I know I had problems the first time I ever made them. I was seriously over-thinking it. Ohhhh…..this looks so good!!! I pinned this recipe! Thanks for the pin Terri! Crepes have always been a favorite of mine. They look delicious, I love fresh in season strawberries. Thanks for linking up to Sweet and Savoury Sunday, stop by and link up again. Have a great weekend! !